I had to pick up this lil koala when I saw him….sooooooo sweet! 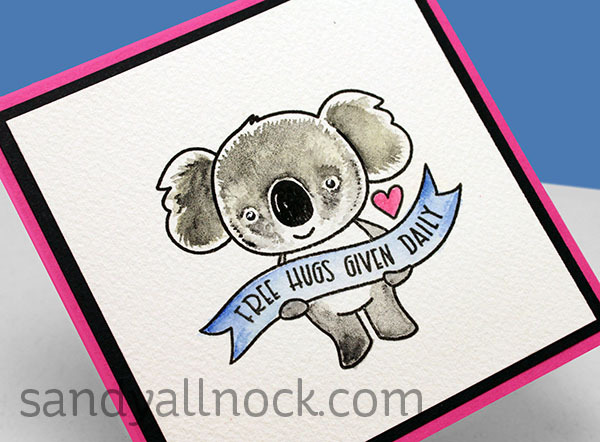 The banner can be swapped out for several sentiments – including valentines – and I chose a free hugs sentiment. Coz I want a hug from this lil guy! Watch the video below or click HERE to see it in HD on YouTube. I just want to hug this sweet guy! What a cute Koala bear, he is adorable. Absolutely a cute and cuddly fuzzy wuzzy bear. He turned out to be very fuzzy looking. Great job and thanks for sharing. He’s so cuddly!! But you made me snort out loud when you said that he was starting to look a little psychotic lol!!! I didn’t see it but seems like their eye balls do look like that 😀 I didn’t know some had blue noses. Now that I have this paint sheet, I can’t wait to do some painting with it. Thank you for this video!!! Clean and simple and absolutely adorable! 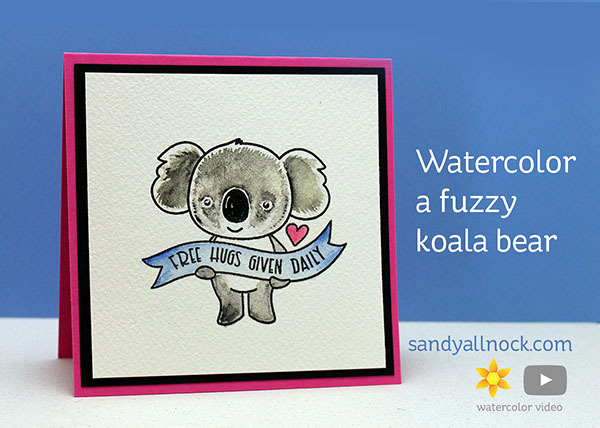 This is a super sweet koala !